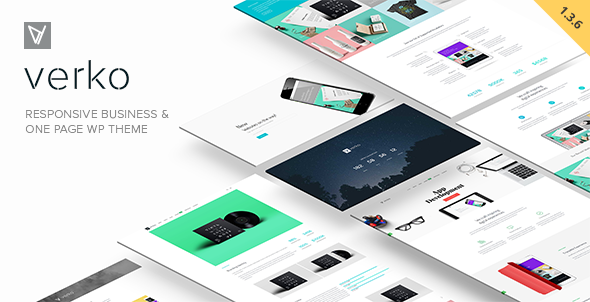 Verko | Responsive Business & One Page WP Theme Created by Dahz. This templates have specific characteristics, namely: Verko has features such as High Resolution: Yes, Widget Ready: Yes, Compatible Browsers: IE9, IE10, IE11, Firefox, Safari, Opera, Chrome, Edge, Compatible With: WPML, Visual Composer 4.11.x, Visual Composer 4.11.2.1, Software Version: WordPress 4.5.2, WordPress 4.5.1, WordPress 4.5, WordPress 4.4.2, WordPress 4.4.1, WordPress 4.4, WordPress 4.3.1, WordPress 4.3, Columns: 4+ . You can use this Verko | Responsive Business & One Page WP Theme on WordPress category for agency, app, blog, business, corporate, creative, landing, marketing, mobile friendly, one page, parallax, portfolio, responsive, seo, wordpress and another uses. Verko is a WordPress theme that focused on Marketing your services or products. with landing pages template, encourage user to take another step forward to your business using the form, call-to-action, photo or video. verko is suitable for any business and agency that need to deliver messages to their potential customer. – Master SliderA premium slider plugin for your premium website. Create professional slider easily for your business. – Vertical Navigationa modern navigation style designed for one page website. see vertical navigation and one page website examples here. – Drag & Drop Visual ComposerEasily create business website design using visual composer a must have feature in wordpress themes nowadays. – Advanced Portfoliowe fully understand that Your portfolio is your business calling card, that’s why we dont limit how you present your portfolio. – WordPress theme CustomizerManage all aspects of your site using a wordpress theme customizer , so you can see exactly how the logo, front, or layout will shown before publish! – TestimonialPotential customers care more about what other customers have to say over anything else, elegantly showcase the testimonial in a slider or list layout and show off as the best business website. – Multi Header OptionFrom modern to classic layout, choose the header layout style that best suits your business needs. – Blank TemplateA unique template with the options to remove header and footer, designed for landing page, splash page, coming soon, newsletter, download page, promotional page or anything! Explore your imagination with our blank template. – Fully Responsive ( mobile friendly )As Google Makes “Mobile-Friendliness” as a factor for their search ranking , we make sure that Verko is mobile friendly. – Megamenu Beautiful megamenu, add beauty and functionality to your site for easier navigation. The default WordPress Menu maker with the ability to add image. – Off Canvas Sidebar & Menu the new trend in website design, keep your website full-width without losing the functionality of sidebar and menu. best business wordpress theme 2015 – we are, and let us prove it to you. Pick up your copy today!